Make It Stick Nail Chevrons - Polish Etc. The nail decals are made of a super thin adhesive vinyl material that sticks strongly to the nail and is flexible (so it stays on). If you are like me and get annoyed with anything bumpy on your nails this shouldn't annoy you. There is an almost unnoticeable bump at the edge of the decal with a single layer of top coat, but with two layers it wasn't noticeable at all. For this mani I used Cult Nails Let Me Fly on four of my nails, added the decals to my thumb and ring finger as accent nails, then added a second accent by doing my pinky in Zoya Trixie. 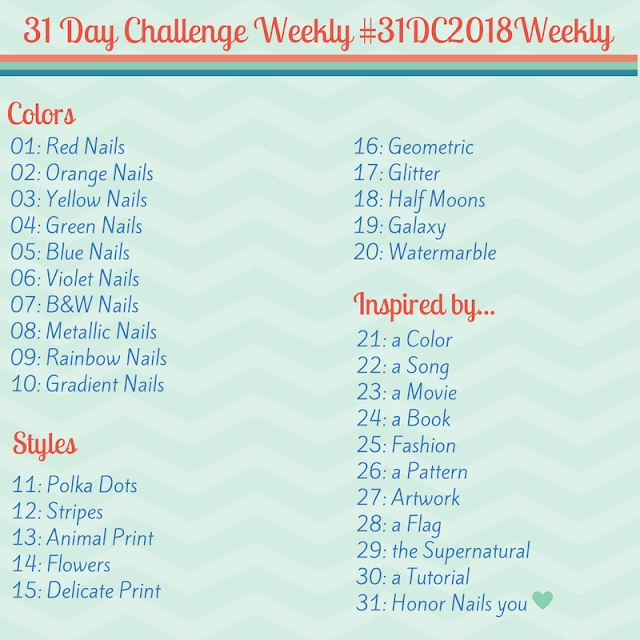 This is a skittlette style mani inspired by Marta of Chit Chat Nails that I actually entered in a contest she had on her blog earlier this year. another mani and read all about the nail decals! I love how this turned out! The chevrons look amazing and required absolutely no effort. On my right hand I decided to do some experimenting because I wanted to see if I could get away with only using two stripes of the chevron on each nail. The answer is yes, it still looks good, just different, sort of like a chevron gradient I think. There are so many things you can do with these nail decals. The chevrons could be vertical, horizontal, or even diagonal. You could use each of the chevron stripes separately to create new designs, or paint over the top of the chevrons and peel them off to create chevrons with different colors or finishes. I can't wait to play with these more. Isn't it funny how awkward my right hand is in photographs? Here are the nail decals themselves. There are enough decals to do 20 nails on the blue backing (although there could be more depending on the length and size of your nails). The decals are quite wide (here's my finger for comparison) and I didn't have any problems with them reaching around even my thumbnails (my thumbnails are too wide for all Konad/Bundle Monster/MASH stamping plates). To apply them, you simply peel the clear transfer tape off of the backing and press them onto your nail, rubbing to make sure it sticks around the edges. It's probably a good idea to make sure your base color is fairly dry before applying the decals since you will be pressing down. Personally, I cut between the decals with scissors so that I wouldn't risk messing up the others. Once the chevrons are stuck to your nails you can peel off the clear transfer tape, trim the sides (I used cuticle scissors) and top it with top coat. I love how easy this makes it to get the decals on straight and spaced perfectly. The chevron nail decals are available from the Make It Stick Etsy shop where a sheet of 20 decals is $5. There are also lots of other patterns and decorations for your nails including cute little mustaches. Follow April on instagram (@aprilshowers2685) to see sneak peeks of her upcoming nail decals! *Disclosure: these products were not sent to me for review, they were purchased with my own money. Oh, these are cool! I love the Chevron design. Effortless is a good thing!!! These are neat!